We can either rent you self powered speakers or dummy speakers (if you already have an amplifier). If you are not sure please select "I'm not sure" in the form below and we will consult you. We're here to help. 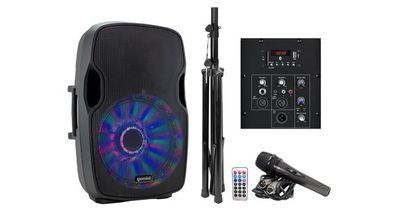 We have different flavors of speaker rentals from Bluetooth capable to wide range power speakers. Some flavors are good for conferences others good for loud settings. If you're not sure we'll help you out. We will make sure we have the equipment you need available for the day and hours you need it for. We like to hook people up so look to be hooked up. How many speakers do you need? Do you need the audio delivered? Let us know how long you need the equipment.